Do you know this little frog? And yet, perhaps he isn’t. He doesn’t have a white band under his eyes. What I do know is that he’s awfully cute and has taken up residence in the water well of one of my pots. 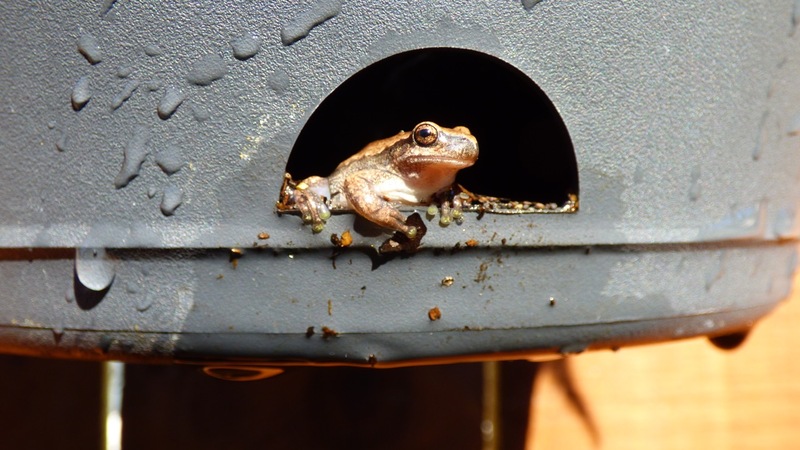 Don’t be fooled by the photo – it’s a small pot, and even though he’s just a pee little frog, he sings loud and proud whenever it rains (at least I’m assuming it’s him I hear), and he was very pleased to receive a ‘sprinkling’ when I watered the plants yesterday. 😀 that is just too funny.